We really love playing with this one. This is the FLASH EFFECT you have been looking for! Use as an opener or at ANY TIME in your act. A 4.25” x 2.50" plastic glass full of confetti is shown from all sides. The magician inverts the glass on his/her hand or tray. (For comedy do it on a spectator’s head!). When the glass is lifted away, instead of getting a shower of confetti, the confetti has transformed into a large 20-flower MULTI COLORED bouquet! The glass is completely empty at the end and can be examined! We really love the clever secret to this effect. Easy to do. Perform in minutes. Glass can be shown all around when filled and examined after the flowers are produced. Includes bag of Mylar confetti that looks great in theatrical lighting or room light or sunshine. You'll be very pleased with this clever piece of magic! You light a torch which burns brightly. Simply pass your hand over the BURNING FIRE and the burning torch instantly transforms into a beautiful silk-like rose! VERY visual magic! Easy to do. ADD a nice dramatic touch by passing your hand in front of the torch and the FIRE JUMPING TO YOUR HAND by using flash paper (as found on this page). SPECIAL: BUY 3 and RECEIVE a 4th FREE! FIRE TRICKS sold ONLY to ADULTS age 18 or older. At checkout you will be prompted to provide proof of age. Appearing Flowers for the 21st Century are here IN A HUGE WAY! A beautiful production item that has a dazzling effect on the eye! This bouquet of flowers can appear from your favorite production item, hanky or from your bare hands! Now in a deluxe SUPER JUMBO size. These flowers are HUGE! They will pack small and play big! Get ready to WOW them! This is stage quality magic that can be performed anywhere! When it comes to flowers BIGGER IS BETTER! This bouquet is an AMAZING 8" tall and 8" diameter and you get 18 flowers to make a spectacular bouquet! Every magician has used spring type flowers in their program one time or another. But this one takes appearing flowers to the new century with our amazing Mylar material. Unlike paper flowers that can wear out and fade over time, our appearing flowers are made of a special plastic film that not only will last longer but also will sparkle in the light. They have a unique corrugated edge that gives each flower a unique look and extra dimension. Whether you make them appear from a production box, dove pan or even bare handed, you will delight in the electric colors and show stopping shine these flowers create. Each flower has its own string which can be tied together for a bouquet effect or produced one by one! Blooms - Vanishes - Reappears & Transforms! Make this part of your routine!! You display a pretty green stem. Now opening a folded fan (or using your hand), you fan the stem causing a small red bud to appear at the top. The bud gradually blooms into a FULL SIZE FLOWER! 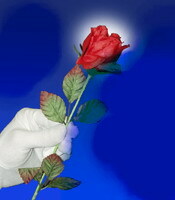 The flower is removed by your left hand. Left hand is now shown to be empty...and with a tossing motion, the flower INSTANTLY appears back on the stem! This can be repeated again and again! For a finale, as the red flower is removed, it INSTANTLY CHANGES TO A 12" red scarf! Complete with everything necessary excluding fan. We priced this EXTRA LOW so all our customers can own this pretty trick. And it's EASY TO DO! Show a paper bag folded FLAT. Show both hands empty. 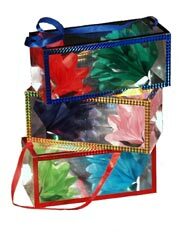 Open the bag, reach in, and PULL OUT a large transparent box FULL of colorful flowers! Your friends will wonder how you did that! Reach in the bag again, pull out a Second box of flowers! Then pull out a Third box of flowers!! Stack the 2nd box on the 1st, the 3rd box on the 2nd. When the boxes are stacked, they are bigger than the bag! Looks incredible, a serious production from an empty, flat bag! Each time you show the bag empty before producing another box. Purchase two of these & you can produce all six boxes from one bag, a real stunner! An outstanding visual illusion that is easy to perform, even surrounded. What is really amazing is that the flower boxes CANNOT FIT back into the bag! They seem to have appeared from nowhere. A wonderful and visual effect & great for any audience. Easy set-up. Paper bag is 8"x3"x6". Each flower production box is 5.75" x 2.75" x 2.75". Set of 3 Flower Boxes. Also see JUMBO STAGE size on this page. SPECIAL: BUY 2 Sets, RECEIVE A 3RD SET OF 3 Boxes - FREE! Just wave your Magic Wand in the air and PRESTO! A beautiful flower appears! So easy - you'll be performing this almost as soon as you get it! Perfect for clowns, children's performers & kids 6 and up. Magicians are expected to produce objects from thin air. This is dynamite production of flowers that is easy for a beginner but is currently being used by professionals on stage. You display a fiberboard wallet that is shown to be empty on all sides. The wallet is closed and given a magical shake. When the wallet is opened a beautiful metallic flower has APPEARED! The wallet is closed again and in a flash opened to find TWO FLOWERS HAVE APPEARED! This is repeated with the appearance of THREE MORE flowers and finally the wallet is shown empty one last time and when opened FOUR MORE flowers are found in its center! YES - TEN FLOWERS appear from nowhere. REALLY SPECTACULAR! This is guaranteed to get a reaction from your audience! + VERY EASY TO DO! + The wallet does the work for you and measures 7 1/4" X 5" when closed, and 9.25” X 7 1/4" when open. + No body loads, can be done surrounded 360 degrees! + Great for stage or close up. Includes 10 modern metallic flowers, made of Mylar. These flowers last much longer than similar paper ones. The colors are rich and the shine is spectacular! + Packs small and plays big. Every magician needs at least one magic production in his or her show. Get yours today and carry it with you everywhere. PRODUCE A BEAUTIFUL RED ROSE FROM A SCARF! You show a red scarf on both sides, then slowly push the scarf into your closed fist. Now you show your audience a stalk having leaves but no flower. You then bring your closed fist above the stalk, like you were placing the crumpled scarf on top of it. When you open your fist a Beautiful Rose has appeared on top of the stalk! VERY easy to do. We include the scarf, the special rose & gimmick & full instructions. BUY TWO, RECEIVE A 3RD ONE FREE! Professional magic that plays BIG yet fits in your brief case! This rarely seen classic has been updated with a modern flair. It will surely delight audiences of young and old. A large lit candle is seen sitting on a turned WOOD base. A gleaming chrome plated cylinder is shown empty (it really is!). The tube is only wide enough to fit over the candle. The tube is dropped down over the entire candle. In a blink of an eye the tube is removed and the candle has transformed into a HUGE COLORFUL Japanese Mylar fan ! The tube is shown COMPLETELY EMPTY! Tube is approximately 16” in highly polished chrome plate. No fail mechanism is part of the design. Extra fans available from us (if you tear them or they wear out). Fire, shiny objects, huge production ending. Be the first to own this gem! Add a dramatic touch by using flash paper as described above. Flash paper found below. Just touch the flame and a brilliant flash of fire appears! For additional or replacement fans, see related items on this page. Visibly & without cover this gorgeous rose transforms into a silk scarf! You enter wearing a beautiful rose in your lapel. Just by touching the rose it transforms the rose into a colorful silk scarf! OR have your assistant wear the rose. Then just touch the rose when you want a silk scarf! Our magical rose is made of a pure silk scarf wrapped around a special gimmick. The 18 inch silk is a $7.95 value, and is included with this trick. Very professional & easy to do. This effect is worth much more! Buy 2, Receive 3rd FREE!